Sylvia Plath (27 October 1932 – 11 Februar 1963) wis a American poet, novelist an short story writer. Born in Boston, Massachusetts, she studiet at Smith College an Newnham College, Cambridge, afore receivin acclaim as a profeesional poet an writer. She marriet fellae poet Ted Hughes in 1956 an thay livit thegither first in the Unitit States an then Ingland, haein twa childer thegither, Frieda an Nicholas. 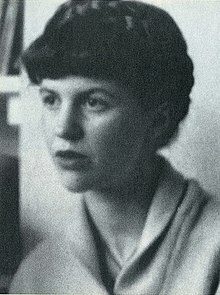 Plath suffered frae depression for hintle o her adult life, an in 1963 she committit suicide. Controversy continues tae surroond the events of her life and daith, as well as her writing and legacy. Plath is creditit wi advancin the genre o confessional poetry an is best kent for her twa publisht collections, The Colossus and Other Poems an Ariel. In 1982, she wan a Pulitzer Prize posthumously, for The Collected Poems. She wrote The Bell Jar an aw, a semi-autobiographical novel published shortly afore her daith. The Bell Jar: A novel (1963), unner the pseudonym "Victoria Lucas"
Alvarez, Al. (2007). Risky Business: People, Pastimes, Poker and Books. Lunnon: Bloomsbury. ISBN 978-0-7475-8744-6. Axelrod, Steven Gould. (1992). Sylvia Plath: The Wound and the Cure of Words. Baltimore, MD: Johns Hopkins Varsity. ISBN 0-8018-4374-X. Becker, Jillian. (2003). Giving Up: The Last Days of Sylvia Plath. New York, NY: St Martins Press. ISBN 0-312-31598-8. Brain, Tracy. (2006). "Dangerous Confessions: The Problem of Reading Sylvia Plath Biographically." Modern Confessional Writing: New Critical Essays. Ed. Jo Gill. Routledge. ISBN 0-415-33969-3. Hayman, Ronald. (1991). The Death and Life of Sylvia Plath. Secaucus, NJ: Carol Publishing. ISBN 1-55972-068-9. Helle, Anita (Ed). (2007). The Unraveling Archive: Essays on Sylvia Plath. Ann Arbor, MI: Varsity of Michigan Press. ISBN 0-472-06927-6. Kyle, Barry. (1976). Sylvia Plath: A Dramatic Portrait; Conceived and Adapted from Her Writings. Lunnon: Faber and Faber. ISBN 978-0-571-10698-1. Kirk, Connie Ann. (2004). Sylvia Plath: A Biography. Westport, CN: Greenwood Press. ISBN 0-313-33214-2. Malcolm, Janet. (1995). The Silent Woman: Sylvia Plath and Ted Hughes. New York, NY: Vintage. ISBN 0-679-75140-8. Middlebrook, Diane. (2003). Her Husband: Hughes and Plath—a Marriage. New York, NY: Viking. ISBN 0-670-03187-9. Plath Helle, Anita. (2007). The Unraveling Archive: Essays on Sylvia Plath. Ann Arbor, MI: Varsity of Michigan Press. ISBN 0-472-06927-6. Stevenson, Anne. (1989). Bitter Fame: A Life of Sylvia Plath. Boston, MD: Houghton Mifflin. ISBN 0-395-45374-7. Wagner, Erica. (2002). Ariel's Gift: Ted Hughes, Sylvia Plath, and the Story of Birthday Letters. New York, NY: W.W. Norton. ISBN 0-393-32301-3. Wagner-Martin, Linda. (2003). Sylvia Plath: A Literary Life. Basingstoke, Hampshire: Palgrave Macmillan. ISBN 0-333-63114-5. Wagner-Martin, Linda (Ed). (1988). Sylvia Plath (Critical Heritage). Lunnon: Routledge. ISBN 0-415-00910-3. Plath, Sylvia, an Karen V. . Kukil. The Unabridged Journals of Sylvia Plath. New York: Anchor, 2000. Print. Wikimedia Commons haes media relatit tae Sylvia Plath. This page wis last eeditit on 28 Mairch 2019, at 03:45.